This Is Reading, a multi-media installation co-produced by Lynn Nottage, with 18 performances over three weekends . It included: archival and artistic film footage, vignettes written by Nottage, choreographed dance sequences, filmed audience “stories,” and large projections of Reading residents on the outside walls of Penn station. After The New York Times named Reading “the poorest city in the country,” playwright Lynn Nottage, who will be Albright’s featured speaker for Commencement 2018, decided to give the small city a special gift—a mixed-media installation involving theatre film, dance and visual art. The article was a follow-up to Reading’s being named the poorest city in the country, and included interviews with several struggling residents. Nottage wanted to know more about the city and to hear more stories from its inhabitants. After making some calls, she was put in touch with the Reading Film Office, whose film commissioner, Santo Marabella, has been her liaison to the Reading community for the entire six years. Nottage spent hours listening to Reading’s people, from the homeless to the city’s leaders. What came out of it was, Sweat, which debuted at the Oregon Shakespeare Festival in Ashland in 2015, and went on to the Arena Stage in Washington, D.C.; the Public Theatre in New York; and, finally, to Broadway’s Studio 54, from March until July this year. It won Nottage her second Pulitzer Prize (the first was for Ruined in 2009). Sweat was also performed as a free staged reading at the Miller Center in September 2016. But after finishing the play, Nottage wasn’t done with Reading. Because she had become deeply involved with the Reading community, she decided to give it a special gift: a mixed-media installation about the city, involving theater, film, dance, and visual art, presented free of charge in downtown Reading. The result was This Is Reading, which ran for 18 performances on the last three weekends of July. Marabella reported that 3,060 people came to the events, which featured performers from New York City and the Reading area. Many of the behind-the-scenes personnel, from technicians to the production and management teams, were also from the Reading area, including Marabella as a producer. Planning for the project began in 2014, with Nottage and her husband, filmmaker Tony Gerber, and Sweat director, Kate Whoriskey, as the core creative team. They chose the iconic Franklin Street (railroad) Station, renovated but still empty, as the venue. There was film of Reading then and now; devastating archival film of the demolition of historic buildings on Penn St. from Reading 1974: Portrait of a City (Gary Adlestein, Costa Mantis, ’74 and Jerry Orr); vignettes written by Nottage; and dance sequences by choreographer Rennie Harris. 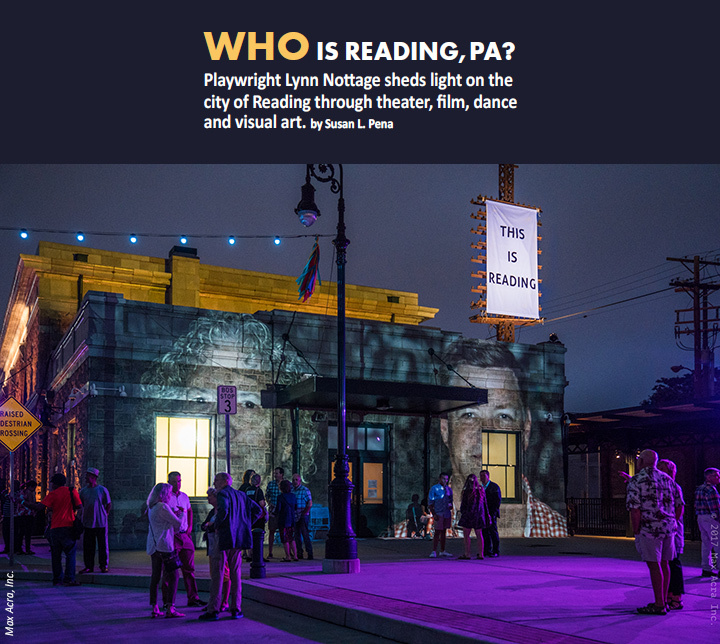 There were also short videos of members of the audiences who participated in the “Reading Speaks” story booth, as well as large projections of Reading residents on the outside walls of the station. 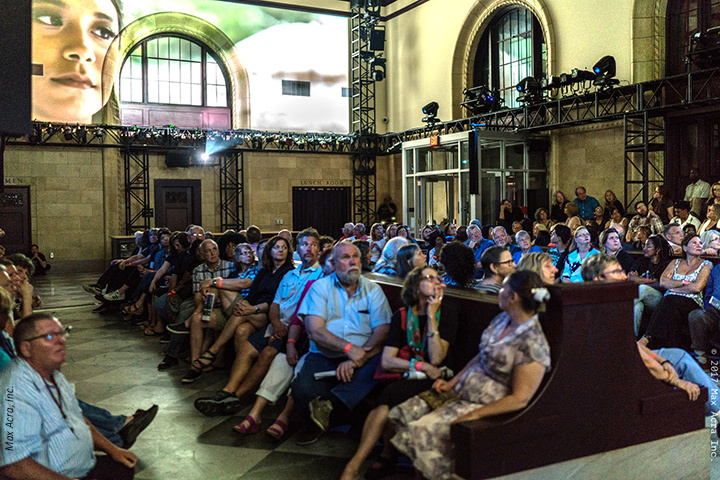 Audience members could peruse videos, sketchbooks by Reading residents in the Reading Room and watch music and dance performances by local artists before and after the shows. Visitors to “This is Reading,” Penn Station, watch film footage integral to the multi-media presentation. Five graduates of Albright’s award-winning theatre department were hired to be a part of This Is Reading. All of them agreed it was an experience they’ll never forget. Alexis Jenofsky ’17, who majored in theatre with a minor in arts administration, said that after seeing Sweat at the Miller Center, she followed the This Is Reading project on Facebook. When the position of company manager opened up, she applied and was hired. Helping one another was a theme carried throughout the production, Jenofsky said. One day, muralist Katie Merz was decorating the wall of a boarding house across the street from the railroad station. Sarah Crake ’16, a veteran Domino Player and future Americorp volunteer, recently apprenticed for a year with the National Theatre Institute. After seeing Sweat on Broadway, Crake realized that Nottage shared that vision. She was moved by the play, whose dialogue accurately reflected that of the regulars at Mari’s Six Pac ‘n’ More, where she has tended bar for several years. So when her Albright roommate, Jenofsky, told her the position of assistant to Kate Whoriskey was open, she quit another summer job to take it. “This is the kind of work that needs to be done,” she said. “There was a lot of taking notes, running to get coffee and making copies,” Crake said. “I became more involved with note-taking so Kate could have her whole body involved in directing. When the show was extended for a third weekend, I also took over for the assistant stage manager, who couldn’t be there for those performances. Sean Sassaman ’16, who grew up in the Reading area, switched from business administration to theatre after taking a class with Jeffrey Lentz ’85, Albright’s senior artist-in-residence and music department co-chair. Sassaman was also recruited by Jenofsky to serve as assistant stage manager for This Is Reading. “I dove head-first into the project,” he said. Because rehearsals started near the end of June and the New York contingent, including production stage manager Lisa Mc-Ginn, didn’t get there until early July, Sassaman said, “it was a little stressful at first,” because he was in charge of the rehearsal process, making sure everyone had what they needed and creating rehearsal reports. Fortunately, he had plenty of experience from his time at Albright. “We didn’t have everyone in the room until tech week, and then we were there 10 hours a day,” he said. “In some ways this project was vastly different, using a totally new kind of space, working with a compressed timeline. Amanda Boandl ’17, fashion design and merchandising, and costume design major, helped create costumes for seven Domino Players productions. She became involved in costuming for This Is Reading through Julia Matthews, associate professor of theatre. As wardrobe supervisor, Boandl worked with costume designer Jennifer Moeller, who has designed costumes for more than 50 shows. Although the show was to have minimal costumes, at the last minute, money became available for vintage ‘50s costumes for the actors and colorful modern costumes for the dancers. She and Moeller scrambled to find clothing that had yet to be fitted. Boandl was in charge of taking in the waists of the dancers and was left in charge of the costumes during the performances— repairing, laundering and acting as a dresser—in Moeller’s absence. Christopher David Roche ’11 double-majored in theatre and history, and is now a professional actor, stage manager, teaching artist and director. In addition to his freelance career, he is the managing director of the Reading Theatre Project (RTP), and an actor and road manager for the Metamorphosis Performing Company in Reading. Roche was cast in This is Reading as a silent actor/movement artist in the ensemble. “There was a lot of risk-taking and figuring out what works,” Roche said. “There was no conventional script, no predecessors for this. There were so many people who were part of the process. Roche said This Is Reading, while much larger-scale, was similar to what he experienced at Albright and in RTP. Nottage was impressed with the Albright graduates. “The week after it closed, a group of people met at the railroad station to see what can be done with it in the future,” he said, and conversations on the future of Reading are ongoing.